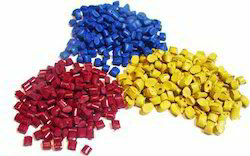 Leading Manufacturer of thermoplastics material from Mumbai. We are counted as one of the reputed manufacturers of Thermoplast Material. We manufacture them using premium quality polymer resins. When frozen, these thermoplastic becomes glasslike. These recyclable thermoplastics can be melted to a liquid and cooled to a solid. Used to make guitar picks, these thermoplastics are of high quality yet affordable. Our range of thermoplastics is popular for its durability. Polypropylene PP Semi-rigid, translucent, good chemical resistance, tough, good fatigue resistance, integral hinge property, good heat resistance. Flexible and ridgid packaging, automotive Bumpers, cladding, and exterior trim , consumer products, and industrial uses. PP fibre is used in tape and strapping. Polyvinyl Chloride PVC Compatibility with many different kinds of additives - PVC can be clear or coloured, rigid or flexible, formulation of the compound is key to PVC's "added value". Window frames, drainage pipe, water service pipe, medical devices, blood storage bags, cable and wire insulation, resilient flooring, roofing membranes, stationary, automotive interiors and seat coverings, fashion and footwear, packaging, cling film, credit cards, synthetic leather and other coated fabrics. Thermoplastic Elastomers TPE, TPR Flexible, clear, elastic, wear resistant and impermeable. Soles and heels for sports shoes, hammer heads, seals, gaskets, skate board wheels, synthetic leather fabrics, silent running gears. Acrylonitrile Butadiene Styrene (ABS) and Other Specialist Styrenics Rigid, opaque, glossy tough, good low temperature properties, good dimensional stability and easily electroplated, low creep. Telephone handsets, rigid luggage, domestic appliance housings (food mixers), electroplated parts, radiator grills, handles, computer housings. Styrene Acrylonitrile (SAN) & Acrylonitrile Styrene Acrylate (ASA) Rigid, transparent, tough, resistant to greases, stress cracking and crazing, easily processed, resistant to food stains. Drinking tumblers, hi-fi covers, lenses, water jugs and toothbrush handles, kitchen and picnic ware, radio dials, TV set screens, washing machine trims. Aramids PI Aromatic Polyamide Rigid, opaque, high strength, exceptional thermal and electrical properties (up to 480'C), resistant to ionising rediation, high cost. Aerospace components, reinforcing fibres, high temperature resistance foams, chemical fibres and arc welding torches. Cellulosics CA,CAB CAP,CN Spectacle frames, toothbrushes, tool handles, transparent wrapping, metallised parts (reflectors etc), pen barrels. Spectacle frames, toothbrushes, tool handles, transparent wrapping, metallised parts (reflectors etc), pen barrels. Looking for Raw Materials ?